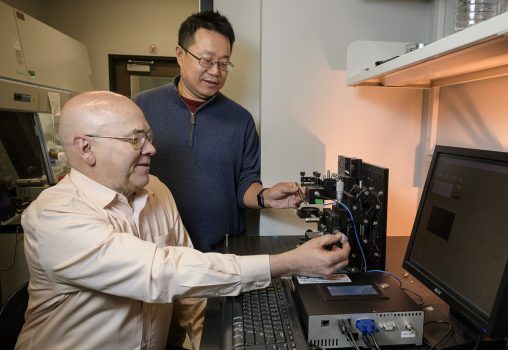 The research was conducted by Elliott Brown, the Ohio Research Scholars Endowed Chair in Sensors Physics, and Weidong Zhang, research physicist in the Department of Physics. Their work was recently published in Nature Communications, a scientific journal that covers the natural sciences, including physics, chemistry and biology. Graphene is the world’s first two-dimensional material having monatomic thickness — a single layer of carbon atoms arranged in a hexagonal (honeycomb) lattice. Its in-plane mechanical properties make it the strongest material ever tested, yet it is very flexible out-of-plane. It efficiently conducts heat and electrical current and is nearly transparent to visible light. Scientists have theorized about graphene for years, but it wasn’t until 2004 that the material was successfully isolated, by exfoliation from graphite crystals — using Scotch tape. That work by Andre Geim and Konstantin Novoselov at the University of Manchester resulted in them winning the Nobel Prize in physics in 2010. “What got people excited about graphene was the fact that it offered the potential for higher room-temperature electron and hole mobilities than any known semiconductor,” said Brown. Mobility is a way of characterizing the acceleration of free-charge carriers and is an important metric for materials used in solid-state electronics of all sorts. Monatomic graphene films on silicon substrates were supplied to Wright State by collaborators at the University of California-Irvine. Brown and Zhang then made precise electromagnetic measurements at THz frequencies using their unique instrumentation. They then realized that the data could be well explained using a common method in electrical engineering called microwave transmission line modeling. Brown says this could lead the way to technology advances in such applications as the beam steering in high-resolution navigational radar systems through smoke and fog as well as millimeter-wave and THz imaging systems of concealed objects through clothing and plastic containers. “A lot of work has gone into studying these applications of graphene, but better engineering is required for their success,” he said.